Try our genuine Morganite Facet Grade Rough Satisfaction Guarantee - compare our prices and our superior quality. Select any natural morganite rough image below to enlarge it. Morganite Mineral Specimen Dimensions: 2.3" x 1.7" x 1.1"
This specimen of natural color morganite has a very beautiful shade of medium orange-pink color. 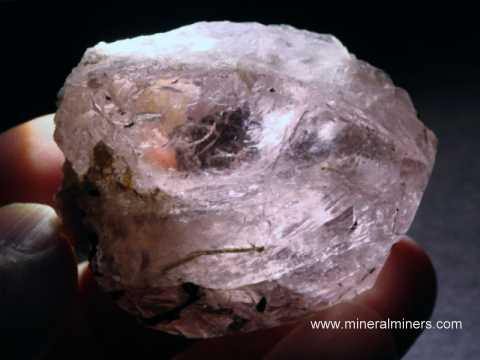 It is a transparent partially terminated morganite crystal with some broken surfaces and with gem-grade areas inside that would yield over 20 carats of lightly included gems. There are several green tourmaline crystals intergrown with this natural morganite crystal. See also a side view of this fine color morganite specimen. This genuine pink beryl specimen has several naturally terminated surfaces in very nice condition. See also another view of this morganite crystal specimen. This is the end of our Morganite Facet Rough page. Would you like us to inform you when we add more natural morganite facet grade rough on this page? We do have additional morganite rough pieces in stock, so be sure to let us know if you have any natural morganite requests. Please contact our webmaster or our 'site' geologist with any questions or comments. © Copyrigh 1998-2019 Gem & Mineral Miners, Inc.® All Rights Reserved.